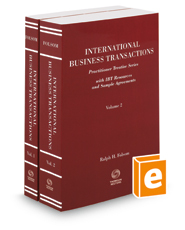 Global in scope, this title covers topics including: international sales law; commercial terms; bills of lading; distributorship agreements; letters of credit; e-commerce; trade law and remedies; the World Trade Organization; customs law; antidumping and countervailing duties; safeguard proceedings; export controls; foreign corrupt practices; boycott and antiboycott law; U.S. and E.U. antitrust law; free-trade agreements; international franchising; patent and know-how licensing; counterfeiting; gray market trading; foreign direct investment; investing in Europe, North America, China, and the developing world; currency controls; expropriation; international business litigation and commercial arbitration; and business immigration law. This product is updated annually.